Thursday Moda #132: Dotty Over Fuchsia Dresses. Hi Guys. 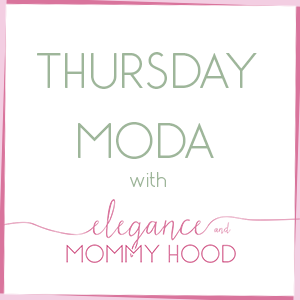 It has been dead silence on my blog since last Thursday Moda. 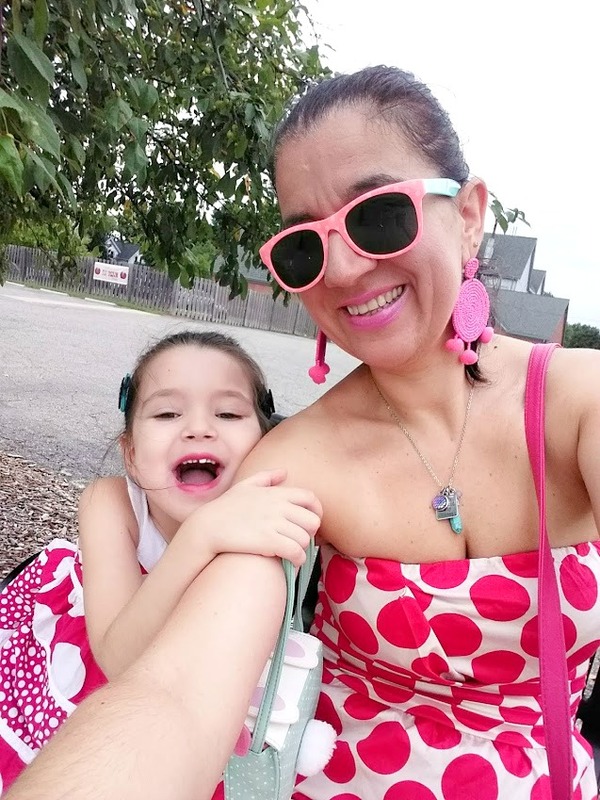 To tell you the truth my work schedule has quietened down a little bit as I have settled into a new Fall schedule now that Vivian started school and goes there every day, full time. But between the start of Kindergarten, getting settled into our new schedule and trying to make the most out of our late afternoons/evenings while it is still warm and doesn't get dark too late, I have tried to not make the blog my priority but rather enjoy and make the most of my free time and most importantly the time I have with my daughter. 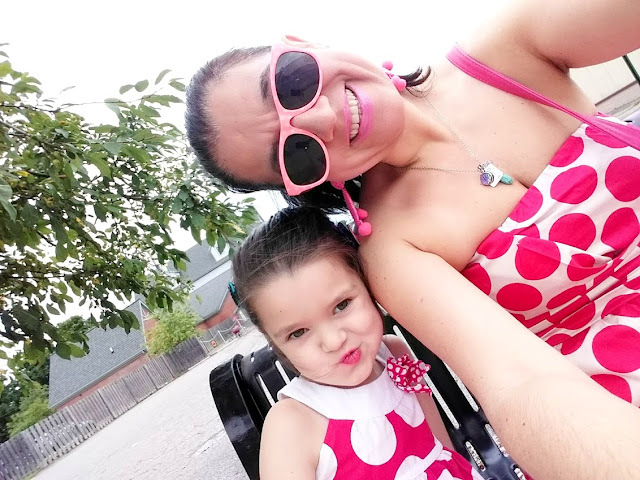 Just like today's photos show - taken a couple of weeks ago, before the starting of the school - we have been making the most of this Summer especially on off days, evenings and weekends. On this particular day we went downtown our little town that we live in, for a little lunch, walking (when it wasn't raining) and gift-shopping. Also, another reason I have been silent is because I have been feeling sick/fighting a cold the last few days. Since Labor Day weekend our temperatures have been between 49 degrees to 95 degrees (50s, 60s, 70s, 80s and 90s) which is crazy. That has done a number on my body and has given me a head cold, too. 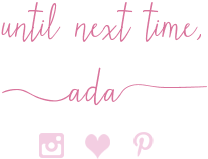 Today (Wednesday) was by far the worst I have felt. Arggghhh!! I haven't even felt like joining any linkups, since last Thursday actually. So, the title of this post "Dotty over Fuchsia Dresses", as in "Nutty Over Fuchsia Dresses", get it?! My Strapless Fuchsia/Neutral Dress with the pretty and very flattering ruched bustier style is by The Limited (when they still had their stores) and it may be a decade old. I love that is a comfy cotton poplin material which makes it perfect for the daytime, though can be dressed up for the evening. 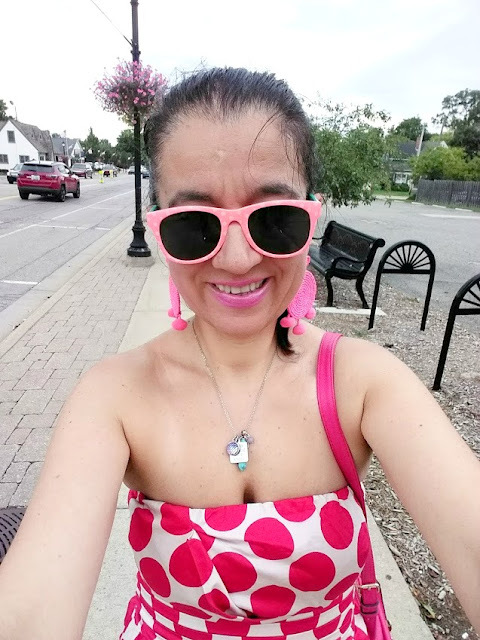 I am normally not one to wear this much pink altogether or be matchy-matchy head to toe but sometimes you have to go for it, so I did. 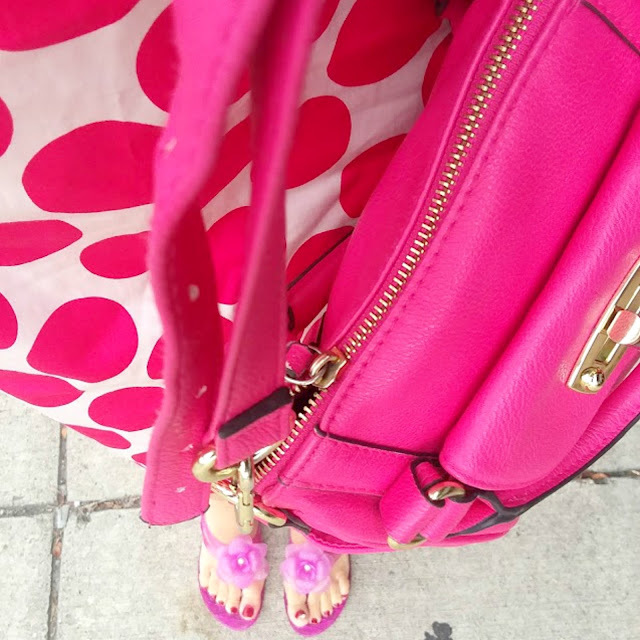 Matching hot pink/fuchsia Jelly Thong Flower Sandals (by Old Navy), Crossbody Satchel (by Target) and Pom Pom Beaded Statement Earrings (by Wal-Mart). I also wore a Bright Pink Matte Lipstick. 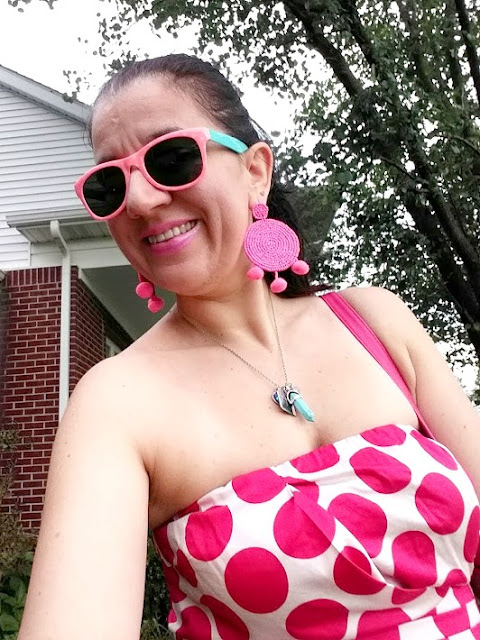 My Coral and Aqua Sunglasses were $1.00 from the dollar aisles at Target. 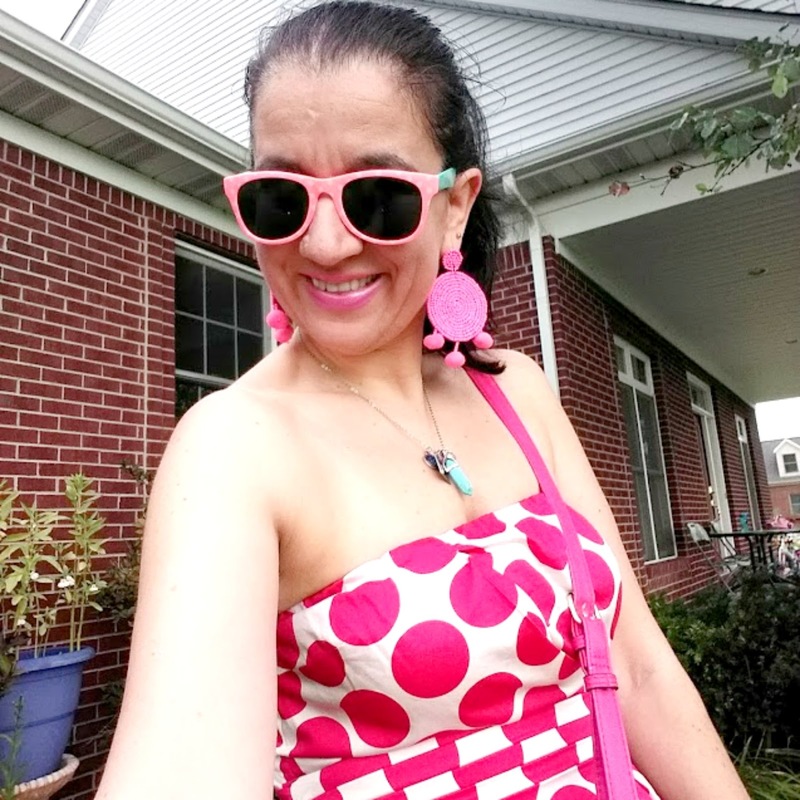 I love that the sunglasses have polka dots on the coral frames. But I added another color pop (turquoise) with my Silver+Turquoise Charm Necklace and Turquoise Beaded Charm Anklet by my creative friend over at Hidden Beaded Treasures. 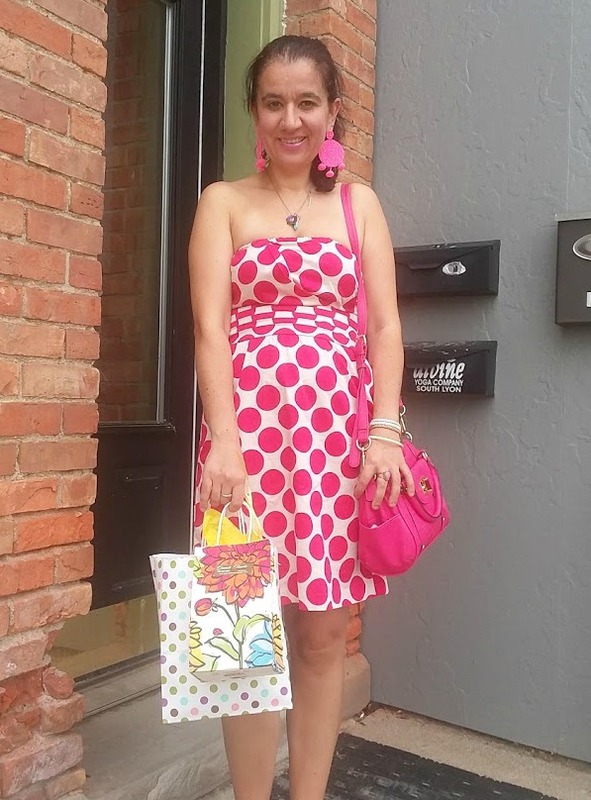 Vivian's own Fuchsia+White Dotty Dress (a Boutique find) has been in her closet since she was 2. 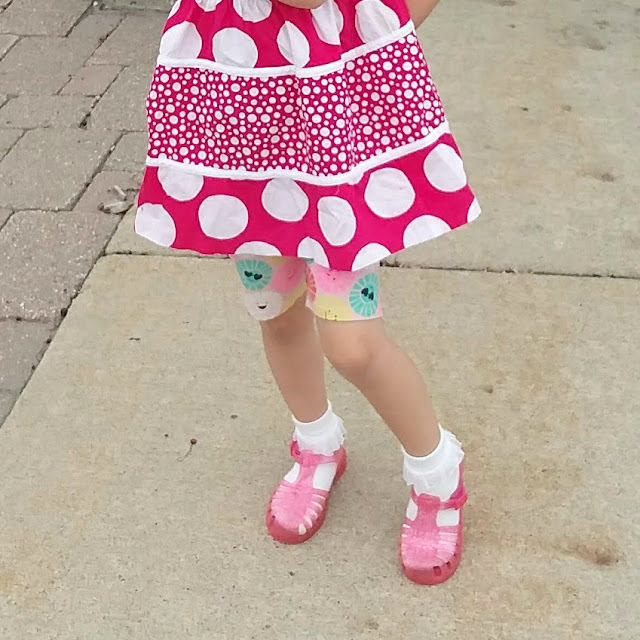 It is one of my most favorite dresses she has owned and clearly though very short on her now, it looks great as a tunic with biker shorts underneath. Her colorful biker shorts have big smiley face circles. 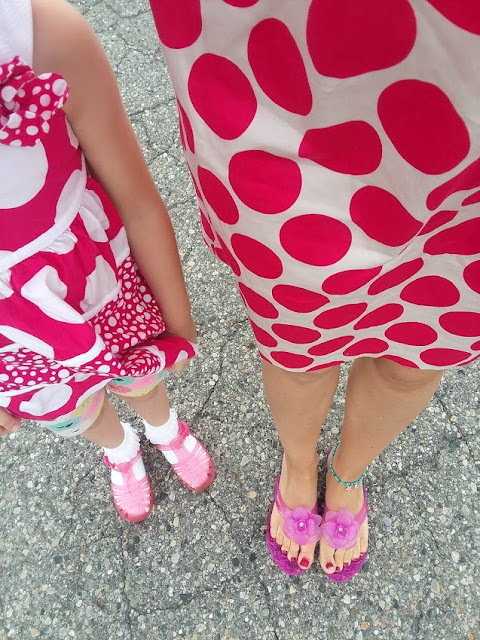 See, I told you we are dotty today! Nuts for dots that is! Big, large dots. As a matter of fact the dots on her dress are the same size as the dots on my dress, so these two dresses perfectly coordinate and match together and we were told on that day how cute we looked matching together, by about a dozen people. Also, both of our sandals are in a jelly material and they are both in a shimmery bright pink (though different shades of pink). 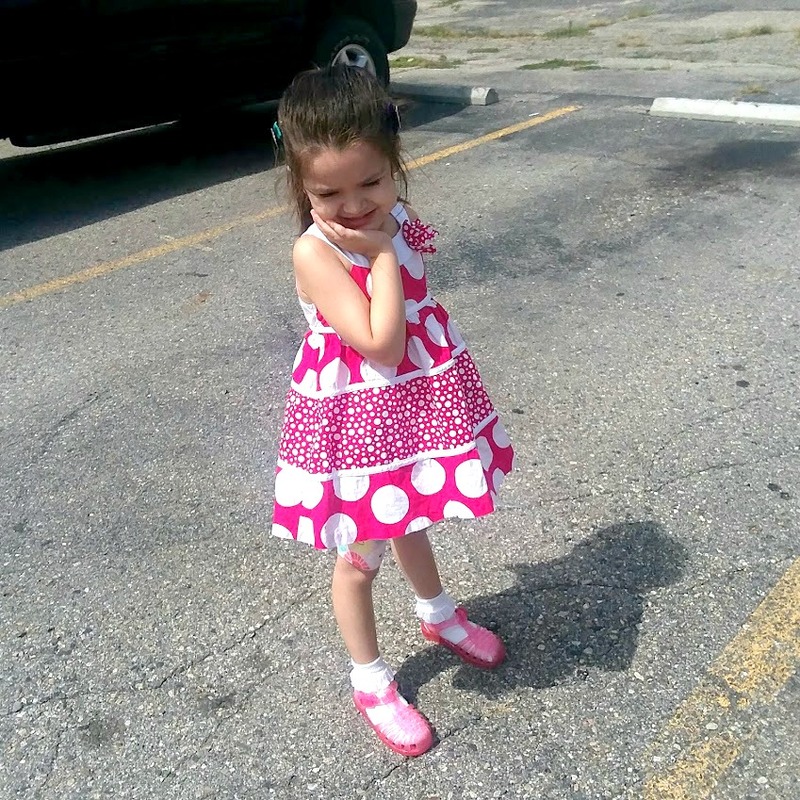 Vivian's adorable sandals are Cat+Jack by Target (these ones). 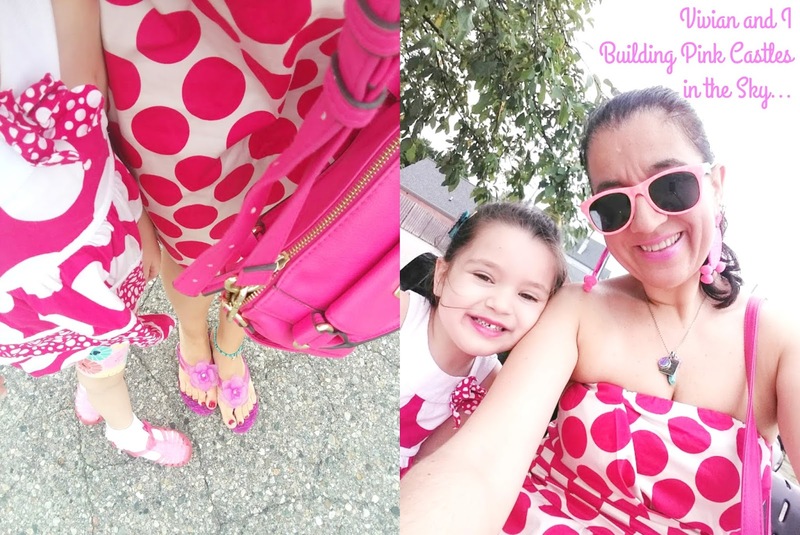 See, funny story about these matching dotty fuchsia dresses, is that either in Summer 2015 or Summer 2016 when we went on our annual family Michigan Summer Vacation, I packed both of these dresses for us to wear and we did wear them one day and took a few pics with them but it rained, and those photos didn't come out nice at all. And believe it or not, it took us another 2-3 years to wear these dresses again, at the same time. I love that Vivian's dots are white against the bright pink and mine are reversed. 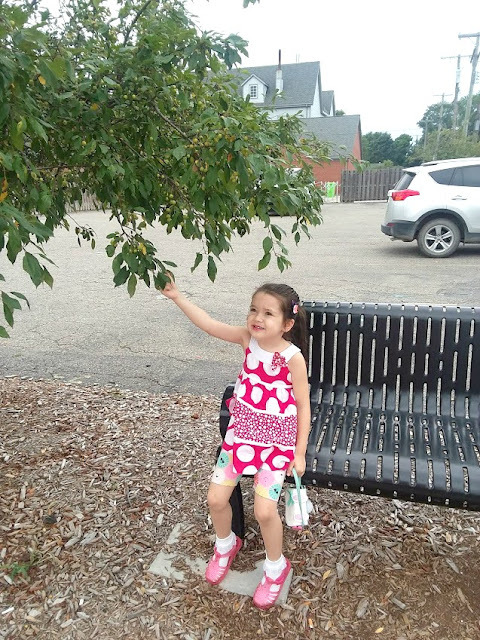 Thank you all for the beautiful, sweet and kind words and compliments you wrote last week on my very special "Vivian is a Kindergartener" post. I appreciate them all so much. A week and a half through school and it seems like Vivian loves kindergarten and loves riding the bus. 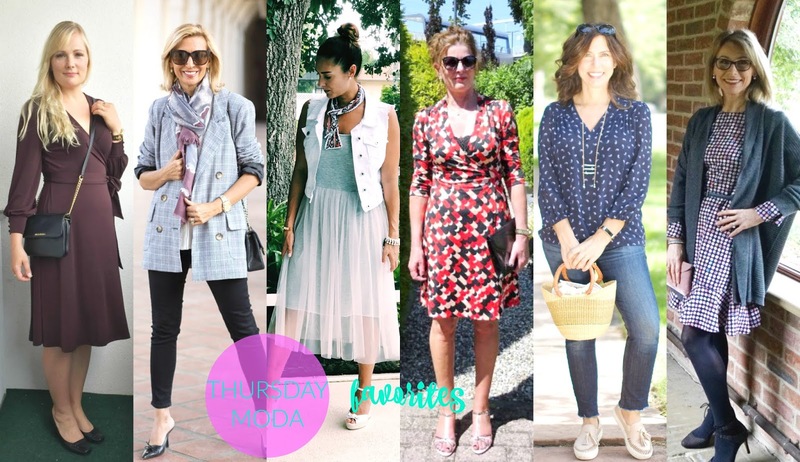 I must say I saw a lot of transitional outfits last week and the following 6 looks I chose as my favorites, feature a little or a lot of Fall, each one of them. 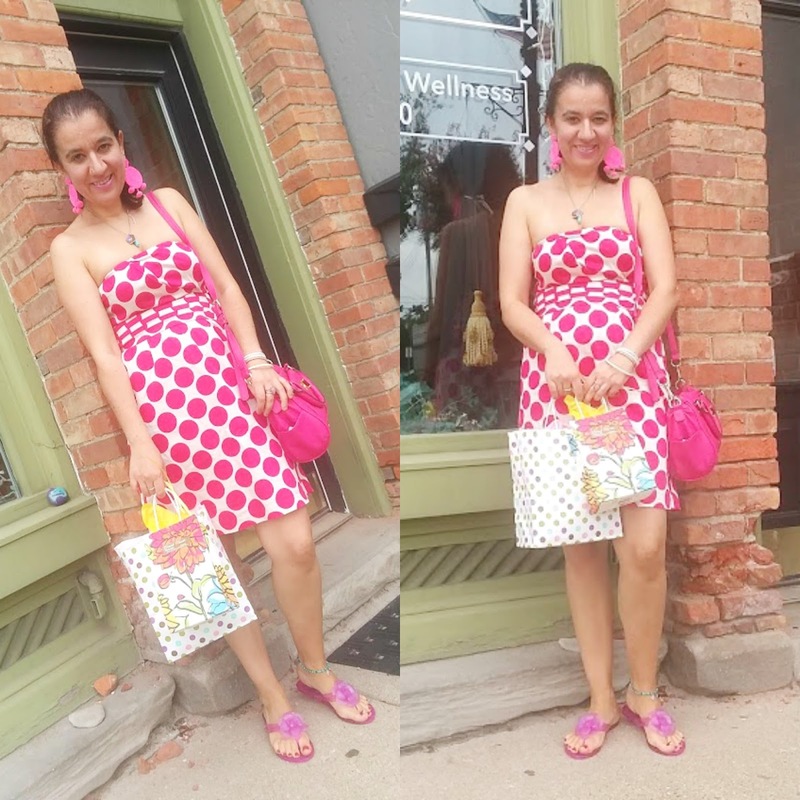 I loved the over 40's crowd whether they styled Classic Wrap Dresses, Skinny Jeans or Tulle Skirts. There is also a young mom in the mix looking fab so soon after giving birth! Leelo is back to blogging and looking sophisticated and timeless in a maroon classic 'Crepe Wrap Dress' which she paired with go-with-everything black pumps and a little black crossbody satchel. I want to add an over-sized 'Double-Breasted' glen plaid blazer to my closet so badly. Even more so considering how terrific Nora looks in hers all layered perfectly for early Fall. Love that scarf. 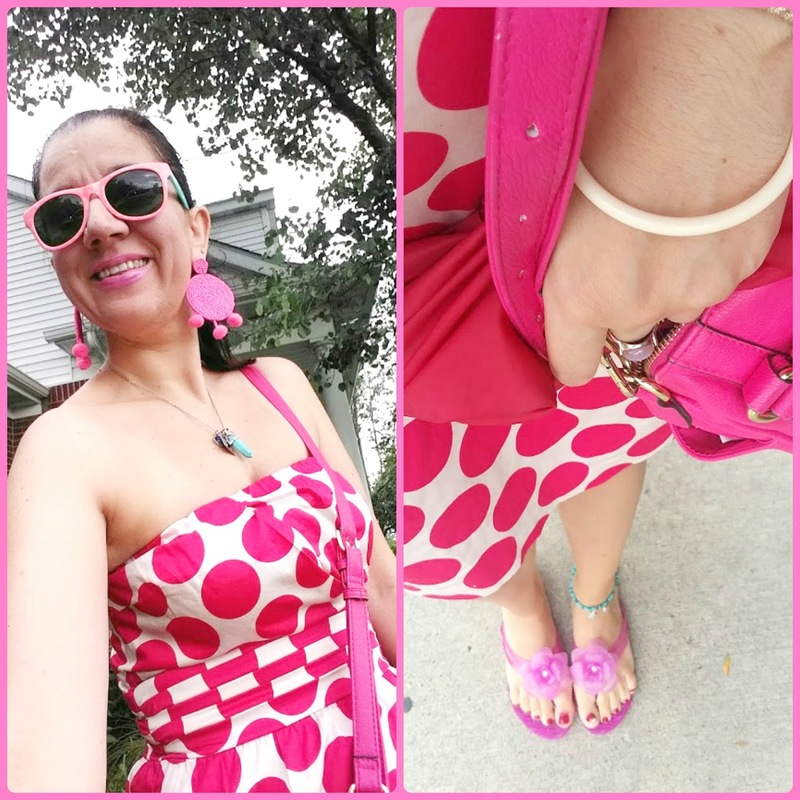 I am so glad 'Tulle Returns to the Blog' my dear friend Chrissy as I first even complimented this look on her Instagram. It even matched Vivian's first day of Kindergarten look and Chrissy nailed it per usual. 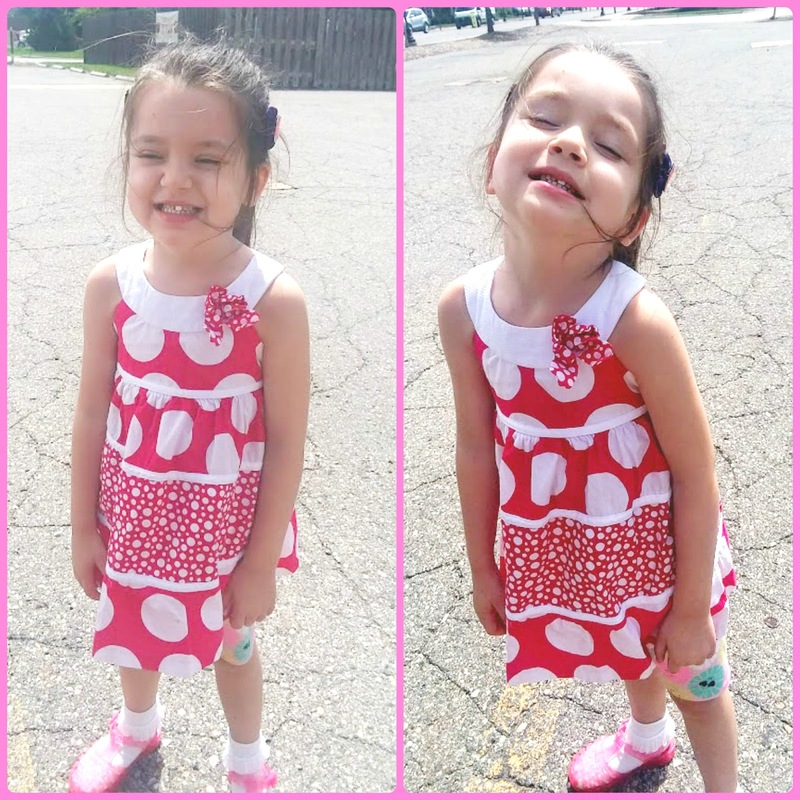 Nora owns many wonderful dresses, this time wearing a pretty 'Graphic Print' one, and I love graphic prints in red and black, even better with some white. Love her heeled sandals. 'Call It a Uniform?' Sure, why not Ana. Like you I love jeans with pretty blouses and comfortable but cute shoes. 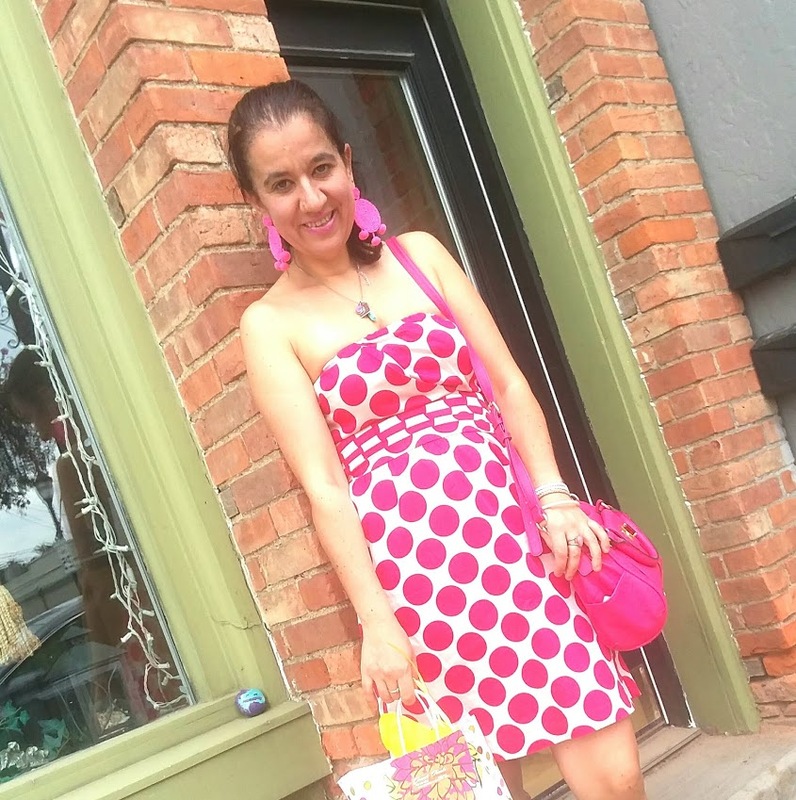 Dear Maria also loves polka dot dresses. 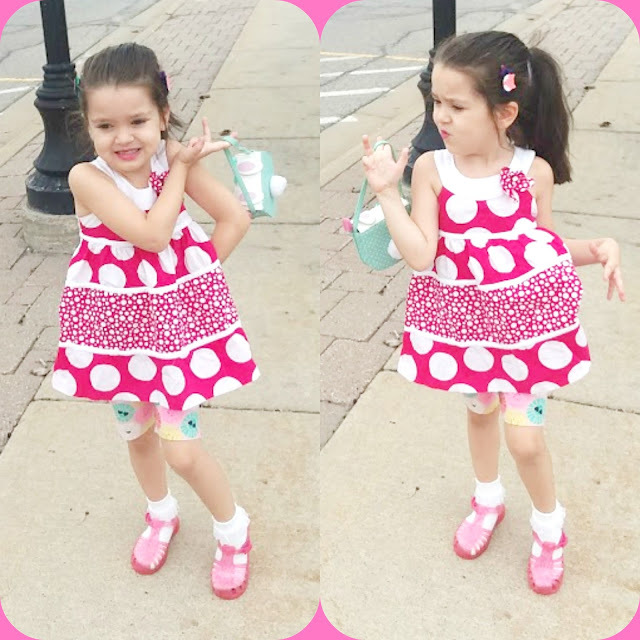 But I love how her 'Polka Dot' is a lavender ombre one, plus that dress has pretty sleeves. The ankle-laced pumps and blush velvet clutch are perfect pieces for Fall and Winter.